Preheat the oven to 450 F (250 C). Oil a baking sheet with the extra-virgin olive oil. Slice each eggplant into pieces about 1 inch thick. Lightly season each disk with salt and pepper and place on the oiled sheet. Bake the eggplant until the slices begin turning deep brown on top, about 12-14 minutes. Remove the slices from the baking sheet and place them on a plate to cool. Lower oven temperature to 350 F (200 C). In an 8 by 12-inch Pyrex dish, place the largest eggplant slices evenly spaced apart. Over each slice, spread 1/4 cup of tomato sauce and sprinkle with a teaspoon of basil. Place one slice of mozzarella over each and sprinkle with 1 teaspoon grated Parmigiano. Place the smaller slices of eggplant over each of the disks and repeat with tomato sauce, basil, and the 2 cheeses. Repeat the layering, until all the ingredients are used. Sprinkle the toasted bread crumbs over the top of the eggplant dish, and bake uncovered until the cheese is melts and the tops turn light brown, about 15-20 minutes. Serve over pasta if desired. In a saucepan, heat the olive oil over medium heat. Add the onion and garlic and cook until soft and light golden brown, about 8 minutes. Add the thyme/basil and carrot and cook 5 minutes more, until the carrot is quite soft. Add the tomatoes and bring to a boil, stirring often. Lower the heat and simmer for 30 minutes until as thick as hot cereal. Season with salt and serve. P.S: This sauce holds 1 week in the refrigerator or up to 6 months in the freezer. Firini 250 C (450 F)’ isitin. Zeytinyagi ile pisirme kagidini yaglayin ve tepsiye yayin. Patlicanlari yaklasik 2 cm kalinliginda dilimleyin ve hafifce tuzlayip karabiber serpin. Yagladiginiz kagidin uzerine yerlestirin. Firinda uzerleri hafifce kahverengiye donene dek yaklasik 12-14 dakika pisirin. Firindan alin ve sogumaya birakin. Firini 200 C (350 F)’a ayarlayin ve 20-30 cm lik bir borcam tepsinin dibine en buyuk patlicanalri diizn. Her parcanin uzerine ¼ su bardagi domates sosu yayin ve 1 tatli kasigi feslegen serpistirin. 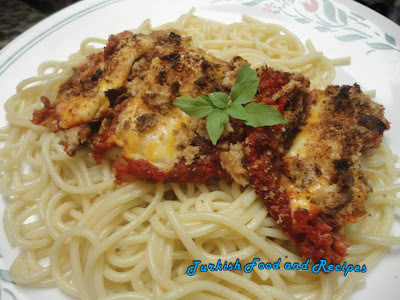 Birer dilim mozzarella/kasar peyniri koyun ve 1 tatli kasigi kadar parmesan peyniri rendesi serpistirin. Geri kalan pelican dilimlerini uzerine disin ve ayni islemi patlicanlar bitene dek uygulayin. Uzerine ekmek kirintilarini serpin ve peynirler eriyip uzeri kizarana dek yaklasik 15-20 dakika pisirin. Arzuya gore makarna uzerinde servis yapilabilir. Orta boy bir tencereye zeytinyagini alin. Sogan ve sarimsagi orta ateste yaklasik 8 dakika pembelesene dek pisirin. Havuc ve kekik/feslegeni ilave edin ve 5 dakika daha havuclar yumusayana dek pisirin. Domatesi ilave edin ve kaynadiktan sonra ara sira karistirarak kisik ateste 30 dakika kadar pisirin. Tuz ilave edin ve koyulasinca atesten alin. NOT: Sosu buzdolabinda 1 hafta, buzlukta 6 aya kadar saklayabilirsiniz. Thanks for posting....this recipe and your photo's look so good. If there is a veggie I cannot live without is eggplant. My all time favorite and you did it justice. this is a very good sie i am anew follower. this dish reminds me of lasagna. 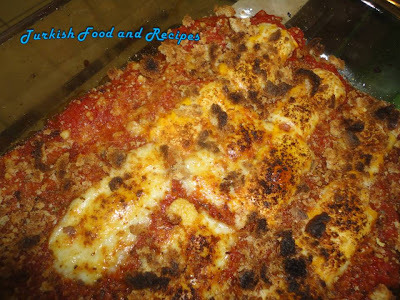 am i right that its the same as a classic meatless lasagna but instead of makarna an eggplant is used?If im not mistaken, I will love to try this one!